I love jewelry. I love bold jewelry, big jewelry, bright jewelry, what some people call, "statement pieces". And I love some fun arm candy AKA appendage bling, arm art, bracelets and such. 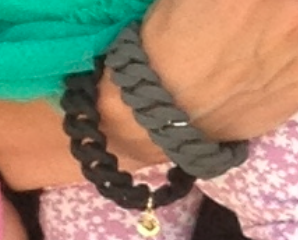 My new bracelets that I saw and fell quite fond of...are these rubber bracelets that look like chain. Who's tired of wearing noisy metal bangles that hurt your wrist? Soften up for some and go waterproof with these colorful wrist dandies! They are the Marc Jacobs Rubber Turnlock Bracelets. I have on the grey and black....but I know they make a neon pink that I bet looks amazing for a summer pop of color! And I love that bright kelly green color above! 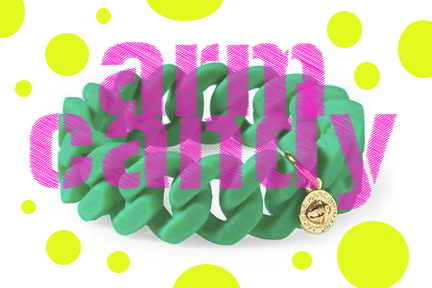 This is a great bracelet for the beach this summer because it's waterproof and so lightweight you don't even feel it! I would just pile these on in neon pink or turquoise! these can be the new jelly bracelets of the 80's!